Oscar is the professional espresso coffee machine which fits in all demands: from the domestic use for tasting good coffee or cappuccino till professional use. homes, offices, small coffee locations. Oscar II is a new generation of the coffee machine launched in the late nineties, which has conquered coffee lovers around the world. Oscar II is the professional espresso coffee machine which fits in all demands: from the domestic use for tasting good coffee or cappuccino till professional use. It called "Musica" and it’s a new espresso coffee machine presented by Nuova Simonelli, for the high level of domestic market. With "Musica" Nuova Simonelli enters directly onto domestic and office markets, presenting the product designed for the professional users, the coffee lovers with big expectations. "Musica" may be also considered as the entry level for the professional market as it is able to serve about 60 cups a day. Appia II 1 group is designed and made for baristas who want to keep serving delicious coffee and cappuccinos, although they have limited space. With the one group Appia II the best technology is concentrated in a small space to offer high performance and high reliability. Low volume locations, locations with minimal counter space, restaurants, small coffee shops. Appia II Compact can perfectly convey high performances in little spaces; it is a traditional machine conceived for those places that want to offer their customers excellent coffees and cappuccinos, but that have a reduced operative space. In only 55 centimetres width, Appia Compact enables to work in complete safety, it is user friendly and guarantees a superior quality in the cup. Locations with minimal counter space, restaurants, small coffee shops and coffee carts. Appia II builds on the success of the Appia. It is a machine with high productivity and high performance wich confirms all the features appreciated by over a hundred thousand baristas around the world. Simple and innovative, Appia II stands out, for proven reliability and even for the modern style that makes it the ideal machine for any room. High volume locations, demanding professionals. 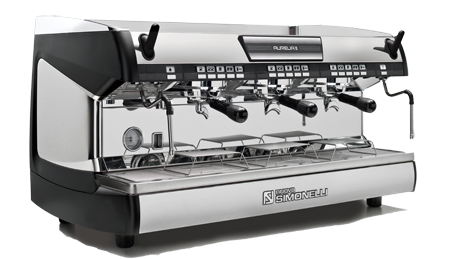 Aurelia is the traditional espresso machine dedicated to best baristas and coffee shop who offer specialty coffee. Aurelia is the World Barista Championship official espresso machine 2009-2011. High quality coffee shops, high volume locations, demanding professionals,barista competitors, specialty coffee shops. Aurelia II is the 2012-2014 World Barista Championship official espresso machine. Aurelia II is dedicated to demanding professional baristas because it guarantees even more advanced performance in terms of accuracy, extraction quality, flexibility and consistency of results. High quality coffee shops, high volume locations, demanding professionals, barista competitors, specialty coffee shops.